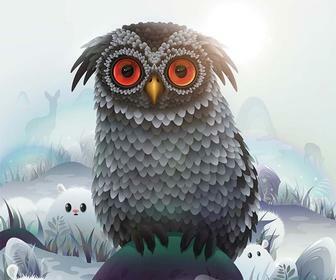 It's unusual to find creative software that is valuable to both experts and beginners alike. 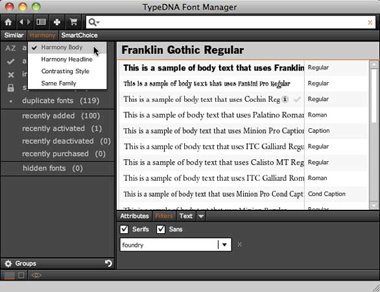 TypeDNA 2.0 is one of these rare products that help users of all levels find the right fonts from their collection. As its name implies, TypeDNA performs its magic by analyzing the shapes and other details of your fonts so it can suggest fonts that are appropriate for common uses. It can also show you fonts that are similar or complementary, or that contrast with a chosen font—even among fonts that aren't currently active on your system. I'm an unabashed font geek, and have been since the Mac's beginnings. However, like many designers with thousands of fonts, I'm often overwhelmed when I need to choose fonts for a project. I may remember a specific font that I think would be suitable, but can't remember the names of similar fonts that may work even better in the project. TypeDNA aims to help by suggesting fonts in my collection that are similar to the one I remember. At other times, I know which font I want to use for a headline, but need suggestions for fonts that would complement that font when used for body copy (paragraphs of text). TypeDNA helps by suggesting complementary fonts. 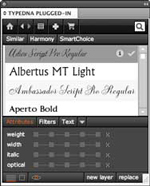 TypeDNA's Harmony feature chooses fonts in your collection that relate to your currently selected font. Here, it's showing good fonts to use as body copy when Franklin Gothic is used for the headline. By performing multiple iterations of finding similar and complementary fonts, TypeDNA helped me quickly whittle my options down to a manageable set. That, in itself, makes the product worth its $39 price. Any time TypeDNA is displaying a list of fonts, you can limit the results to a range of weights, widths, italics, and optical heights. This is handy for narrowing down your choices, or when you need to see a thicker, narrower, taller, or italic version of your font. An additional feature shows you all your fonts that belong to the same family (bold, condensed, expanded, black), which is convenient if you haven't yet activated the entire family and wish to see all the possible styles. But the program goes far beyond that: it can also function as a fully capable font manager, similar in many ways to other commercial font managers. You can group fonts into sets, get detailed information about any font, view its complete character set, flip through font samples in a slideshow, see examples in cascading waterfalls, view by font foundry, see only serif or sans-serif fonts, and so on. I particularly enjoy the Lazy mode in Card view, which lets me sit back and appreciate my fonts as examples slide by. TypeDNA's Card view lets you scroll through your fonts, using their built-in text example, or your own. Because of their more advanced feature sets, I wouldn't put TypeDNA in the same class as FontExplorer X, Suitcase Fusion, or FontAgent Pro, but TypeDNA is a perfectly suitable font manager for many users. However, you don't have to use TypeDNA as a font manager to take advantage of its font-suggesting capabilities—it's perfectly happy to function alongside your existing font manager. In this case you'll need to drag all your fonts onto TypeDNA so that it can let you experiment with all your fonts (active and inactive). But don't worry: you won't be duplicating your fonts because unlike some other font managers, TypeDNA doesn't copy your fonts into its own file management world. If you want to use your existing font manager, be sure not to activate a font from within TypeDNA as it could confuse your other font manager. You'll also need to remember to add any new fonts you acquire to both your existing font manager and to TypeDNA. If your font collection doesn't change very often, and you don't mind activating fonts exclusively from your other font manager, this won't be a big problem. 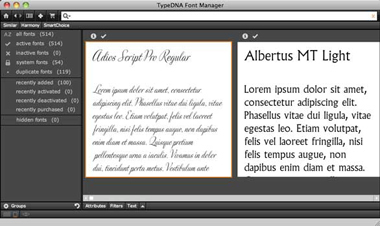 If you use Adobe's Creative Suite 5, TypeDNA can also function as a plug-in for InDesign, Illustrator, or Photoshop. It shows up as a new panel, adding CS-specific features such as changing the font used in a selected text object or group, or creating a new type layer using the text and font currently selected in TypeDNA. It also brings new creative capabilities to CS5, such as the ability to experiment with your inactive fonts in a type layer before activating them. (Without TypeDNA, you would have to use your font manager to activate every font you may want to experiment with—a slow and a painful process.) The panel is resizable, and by default is simplified, although all of TypeDNA's features are available from within it if desired. 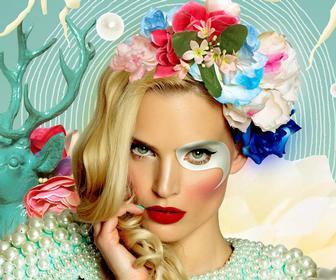 TypeDNA makes extensive use of Adobe's AIR, Flex, and Flash technologies. The developers chose this approach because it simplifies development across platforms (Mac and Windows), allowing them to keep their price low. It also provides hooks into Adobe software products that allow TypeDNA to work directly within them. In addition, it enables TypeDNA to communicate with online services such as a planned font store. Some people may take issue with TypeDNA's extensive use of Adobe's proprietary tools, as it forces a few interface compromises. For example, all controls are within the TypeDNA window, rendering the Mac OS X menu bar useless or redundant. Also, its interface items don't always update immediately when you resize its window. Because it relies on Adobe AIR to function, when you first launch TypeDNA, it checks to make sure you have Adobe AIR and are running the current version. If you're not, it will download and install it for you. Interface issues notwithstanding, TypeDNA is a unique and valuable tool. Beginners can use it as a stand-alone font manager, as well as to explore their font collections, learn about how fonts work together, and choose fonts that harmonize with each other. Creative professionals can also use TypeDNA to bring new font capabilities into Adobe InDesign, Illustrator, and Photoshop. 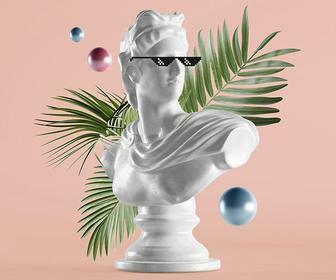 Notably, the Website has an ingenious interactive overview of all the features in the interface, which lets you step through every feature by pressing forward and backward arrow buttons. For £28, TypeDNA 2.0 belongs in everyone's toolbox.